SMG Studio, the team behind Death Squared, has released a chart detailing the game's sales over the last year. There's all sorts of interesting data in here. Check out their full Reddit post below. Death Squared has been out for more than 400 days on Switch & we're still doing OK. Note: this does not include Japan eShop as that's through our publisher Circle. 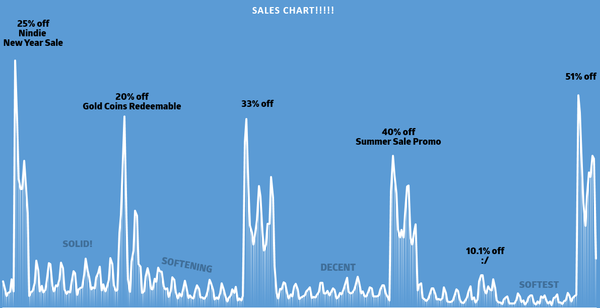 Here's how "sales" impacted the chart. Note: we have "early" announce every sale 3-5 days before it starts. 10% off = experiment = Don't do that. 25-33% seems to be sweet spot between sales/rev. As 51% off while slightly higher unit sales is generating us less revenue. Even with the lower tail we regularly sell more in a day than we do in a ~week~ on other consoles/Steam. But again I caveat this that the game never really found an audience on those platforms. Fun Fact: We saw an increase in full price sales on Xbox during the month of Games with Gold when we were FREE! During that period our sales were close to what they are now on Switch. So that defies logic. I guess word of mouth? Increased promotion to ALL Xbox users? The "SOFTEST" zone was a worry for us as you can see we were going well and then right after the 10% off sale we dropped down to lowest ever. It's been a while since we've been in the charts so I can only dream of the kind of sales Overcooked, Hollow Knight and the other massive hits generate. They probably generate more in a week/month than we do in the year. So success is always relative. So sharing this as it might help other devs, it might explain to you the players why games don't deep discount as much as Steam. Q: Is 6 sales in a year too much? From a % point of view it's around 20% of the year we're on sale.